The hotel was clean and the rooms very well presented. In addition, the food was of a very high standard and the hotel is well located, very near the beautiful Cala San Vicenc bays. However, the hotel lacked atmosphere and seemed to be rather joyless in most respects. I enjoy relaxing, but I prefer to do so in an environment which is friendly, serene and pleasant. However, I often felt very uncomfortable in an atmosphere which seemed to be full of staff who -whilst friendly - were over stretched. In addition, there was a continual feel that you were 'on show' and just not able to relax and enjoy your holiday, even in a quiet way. 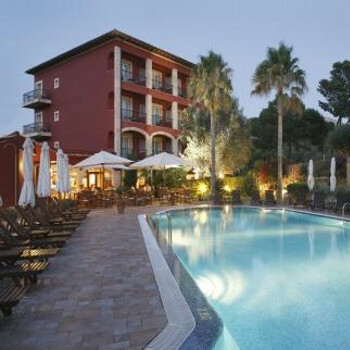 This hotel would appear to suit someone who does not specifically enjoy the beautiful island of Mallorca in any way, but instead prefers to just 'get through it' and be grateful they are staying in a place where they will not be disturbed. All in all, I did not feel I got value for money. Some areas of the hotel were shabby and neglected. The shower in the bathroom was not much more than a trickle. The food was very ordinary and very much catered to the British taste. The staff did not want to go to too much trouble to serve you. Several times we gave up waiting to get a drink. Stayed in this hotel in 2005. So impressed, we are going back in 2006. The whole ambience is excellent. The welcome from the staff, the service whilst staying, nothing is too much. The breakfasts were excellent and the meals in Cavall Bernat, out of this world. The trattoria was extremely busy both with hotel guests and others who were staying elsewhere. Here to the food was very very good. The hotel is in a quiet location but then all of Cala is quiet but the views and the relaxation were just what we wanted. It might seem strange that we gave entertainment a 5 when there was very little provided, but that is our idea of heaven as opposed to the raucus karaoke by drunks who cant sing you get in many other holiday hotels or bands who can't play. We have stayed at this hotel on 5 or 6 occasions. The staff are exceptionally friendly and helpful and nothing is ever too much trouble. It is family run hotel and there is little turnover of staff. The meals are of the highest quality in terms of taste and presentation. There is also a trattoria based within the hotel if you feel like a less formal meal.